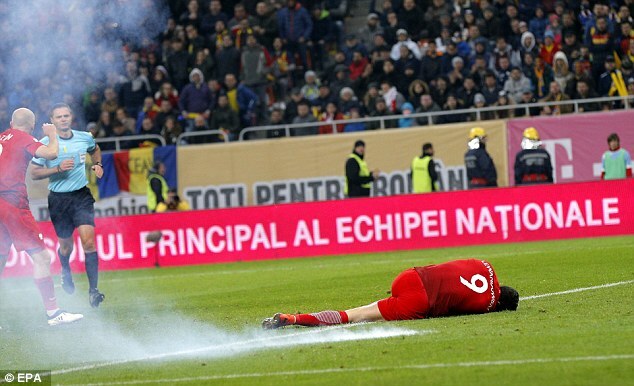 Poland’s World Cup qualifier with Romania had to be suspended when a firecracker exploded at the feet of striker Robert Lewandowski. 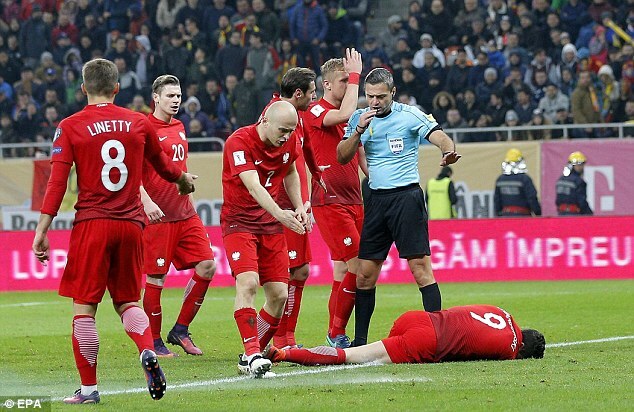 The Bayern Munich man, captaining his country in Bucharest, was left flailing on the turf on Friday night when a missile was thrown from the Romanian supporters. 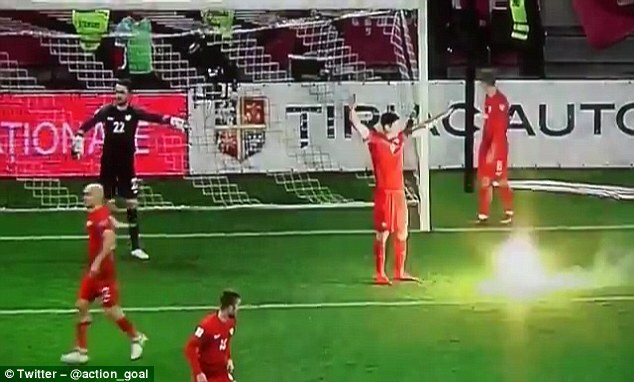 After initially signalling to the referee that the flare had landed inside the parameters of the pitch, Lewandowski was sent to the ground when it exploded close to him. The match was then stopped for 10 minutes as the 28-year-old received medical treatment, holding his ears in considerable pain. Although the game then continued without further incident, it was not the first problem encountered during a feisty World Cup qualifier. A flare thrown from the stands earlier in the match had burned a hole in a goal net, while there was also fighting between both sets of fans during the first half. 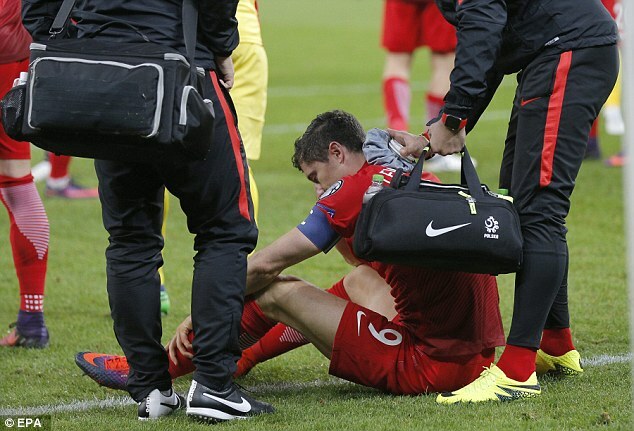 After the game, Lewandowski reacted to the incident with a tongue-in-cheek message posted to Twitter. Quite simply, the former Borussia Dortmund striker posted an emoji of a monkey holding its ears, clearly in reference to his on-field reaction. 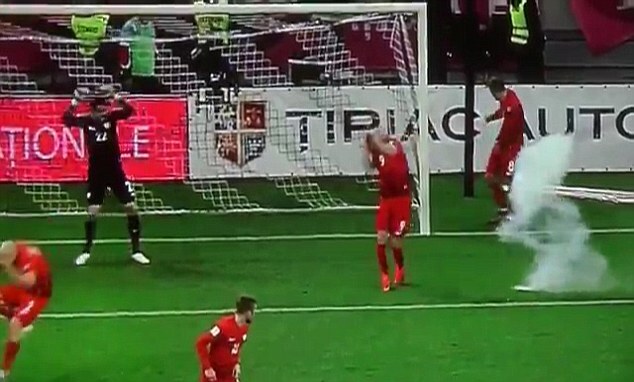 During the match itself, Lewandowski scored twice to give Poland a simple 3-0 win, moving them top of Group E.
Kamil Grosicki scored the other – a brilliant solo effort – as unbeaten Poland took their tally to 10 points from four matches. The Rennes winger collected the ball in the centre circle, weaved his way past five Romania defenders and gave keeper Ciprian Tatarusanu no chance with a powerful shot for his ninth international goal after 11 minutes. Vlad Chiriches came closest to scoring for the home side when keeper Lukasz Fabianski parried his close-range effort in the 32nd minute. The match was interrupted for a minute at the end of the first half after fans threw flares and firecrackers on to the pitch. The ugly scenes continued early in the second half with the Lewandowski incident, while Romanian police detained six Polish fans for violence before the game. Romania, who lost for the first time under German coach Christoph Daum, are now fourth in the standings with five points.